The transition from "married" to "married with children" can be tough. Before they know it, a once youthful and energetic married couple finds themselves in a minivan loaded with noisy kids and littered with Cheerios, crusty Sippy cups, banana peels, and missing library books. Remember those vows you took at the altar? As much as you love your children and work hard to nurture and train them for the future, the challenges that come with parenthood can make the "for better or for worse" promise a hard one to honor. For Better or For Kids shows how couples can keep their love alive even when kids come along. Patrick and Ruth have been married for more than sixteen years, have four children, and have served in local church ministry for the past fourteen years. As Patrick has counseled couples who are preparing for marriage, who are working to strengthen their marriage, or who are desperately trying to save their marriage, he frequently reminds them that, in Christ, there is hope for this season in life. For Better or For Kids is about remembering that even when you feel worn out, over-extended, and neglected, you promised to be a team. It is about making a vow to love your spouse with kids in the house. By God's grace, couples can have a loving and intimate marriage regardless of the season. 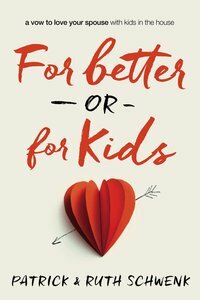 About "For Better Or For Kids"
Patrick Schwenk is a husband, father, and pastor. Ruth Schwenk is a wife, stay-at-home mom, pastor's wife, and blogger. They are the creators of For the Family ( www.forthefamily.org ) and The Better Mom ( www.thebettermom.com ). Patrick and Ruth met while attending the Moody Bible Institute in Chicago, IL and have been married for sixteen years. They have four children ages five to twelve.nbsp;Patrick is a husband, father, and pastor. Ruth is a wife, mom, and blogger.nbsp; She is coauthor (with Karen Ehman) of Hoodwinked: Ten Myths Moms Believe & Why We All Need to Knock It Off. She and her husband are the creators of For the Family http://www.forthefamily.org nbsp; and The Better Mom http://www.thebettermom.com . Patrick and Ruth met while attending the Moody Bible Institute in Chicago and have been married for sixteen years. They live in Bryan, Ohio, with their four children. Ruth Schwenk is the wife of a pastor, who is her best friend and the love of her life. She is a blessed mother to her four beautiful children, and she eagerly awaits meeting her five others in heaven . Ruth is a graduate of Moody Bible Institute in Chicago. nbsp;She has a passion for following God, leading worship, rescuing orphans, and inspiring others to create a God honoring family. She thoroughly enjoys warm spring breezes, blooming lilacs, tall skim mochas with whipped cream, root-lifter, eye cream, gel polish, laughing (lots of it), venti iced teas, exclamation points! !, family worship time, and snuggling up to read a good book with her family. Ruth is a speaker, writer, and creator of The Better Mom website. She can also be found at For the Family , a site just recently launched by her and her husband, Patrick.